The typical honeycreepers are small birds in the tanager family. They are found in the tropical New World from Mexico south to Brazil. They occur in the forest canopy, and, as the name implies, they are specialist nectar feeders with long curved bills. The four Cyanerpes species have colourful legs, long wings and a short tail. The males are typically glossy purple-blue and the females greenish. As you can see from this photograph they don’t know they are tiny birds, they will challenge anyone they don’t like. Thankfully this little guy decided he liked me 🙂 Many more photos coming soon. Even a photo book! Deborah Carney is a professional photographer that loves nature in all it’s forms. 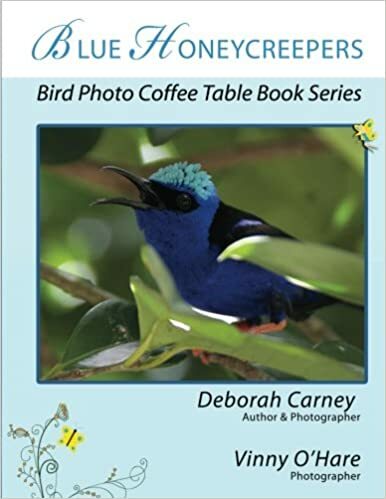 Publishing several series of books that are not only full of beautiful photographs, but also explaining to readers what the photographs are of, in many cases including appropriate inspirational quotes and poetry to augment the value of the books. Vinny O’Hare is newer to the photography scene, but has a great eye and is a co-photographer on many of Deborah’s books, as well as publishing many books of his own. Located at 1,200 feet in the mountains of the Northern Range, seven miles north of the town of Arima, the Asa Wright Nature Centre (AWNC) is a world-class natural history destination for students of tropical ecology and is of particular interest to birdwatchers. A hand-held VX2000 provided these shots of a Green Honeycreeper, a Purple Honeycreeper and of course what I believe to be a White necked Jacobin Hummingbird visiting the nectar feeders. Filmed at The Nature Conservancy’s Waikamoi Preserve on Maui, this short video shows the perfect fit between the long bill of the scarlet ‘i’iwi, a native honeycreeper, and the curved, tubular flower of the blue ‘ōpelu, a native lobelia. This is a text book example of “co-evolution” — a phenomenon in which two interacting species, typically an animal and a plant, evolve together in ways that are beneficial to both. In Hawai’i, honeycreepers and lobeliads evolved in a tight relationship of feeding. The fit of beak to flower is often so precise that the bird can draw nectar while maintaining a clear view of the world, alert for avian predators such as hawks and owls.